Recent press reports have raised the possibility that North Korea is developing the capability to launch ballistic missiles from submarines. A review of commercial satellite imagery since 2010 covering submarine bases and submarine shipyards has identified a new test stand at the North’s Sinpo South Shipyard, probably intended to explore the possibility of launching ballistic missiles from submarines or of a shipboard vertical launch ballistic missile capability. The new installation is the right size and design to be used for the research, development, and testing of the process of ejecting a missile out of a launch tube as well as evaluating its compatibility with submarines and surface combatants as well as the missiles themselves. While the potential threat from a future North Korean capability to launch ballistic missiles from submarines should not be ignored, it should also not be exaggerated. If the North decides to pursue such a capability, it is likely to take years to design, develop, manufacture, and deploy an operational submarine-launched ballistic missile (SLBM) force. While the development of submarines carrying ballistic missiles could provide North Korea with a survivable second-strike nuclear capability, aside from the technological challenge, it also assumes that Pyongyang would entrust an operational nuclear-armed missile to the captain of a submarine who would, in time of war, most likely be out of communication with the leadership. Exactly what missile system would be utilized is purely speculative at this point in time. North Korea’s capabilities would be stretched to their limit if it used a large liquid-fueled system such as a naval version of the Musudan intermediate-range or Nodong medium-range ballistic missile. A naval version of the liquid-fueled Scud, solid-fueled short-range ballistic missiles like its current KN-02 model, or an entirely new system would likely present less of an engineering challenge. Alternately, if North Korea could access vertical or torpedo-launched cruise missile technology, these might present the easiest and fastest routes to a submarine launch missile capability. North Korea has a long history of placing rockets and missiles on small naval combatants, beginning in the 1960s with the acquisition of komar and osa class fast patrol craft armed with anti-ship cruise missiles and the mounting of 122 mm or 240 mm multiple rocket launchers on chaho class fast patrol craft. Subsequently, the Korean People’s Navy (KPN) mounted upgraded missiles such as the CSS-N-1 SCRUBBRUSH, CSS-N-2 SAFFLOWER or KN-01 on its patrol craft and frigates. While all these systems are anti-ship cruise missiles it also appears they had a limited land attack role against coastal targets. They, however, faced three substantial challenges. First, the existing fleet of WHISKEY and ROMEO class submarines was seriously limited in its ability to be modified into ballistic missile carriers. Second, the North Koreans had no technical experience with the requirements for installing and launching ballistic missiles from submarines. Third, the North did not possess a ballistic missile that could be easily modified for sea-launch from a submarine or surface ships. Regardless, the North Koreans undoubtedly examined the boats at great length before they were scrapped. This provided the KPN with new insights into general Russian submarine design that could be utilized in future submarine developments. Significantly, an examination of the GOLF II class submarine, which was originally equipped with three SS-N-5 SERB ballistic missiles, was very instructive since it reportedly retained significant elements of the missile launch system including launch tubes and stabilization subsystems. The boats, however, did not include either missiles or associated launch control systems. By the early 2000s, North Korea was experimenting with incorporating ballistic missile launch technology into sea-based systems. Initial steps were reportedly centered on an effort to base these systems on a merchant vessel. There were three possible objectives: 1) mounting the launch rail and associated equipment from an existing wheeled transporter-erector-launcher into the hole of a merchant vessel to test the feasibility of a rudimentary seaborne platform; 2) a more ambitious effort similar to the short-lived Soviet Project Scorpion program from the early 1960s designed to provide a rudimentary sea-based ballistic missile capability by mounting the systems on cargo vessels; or 3) producing a simulator to test launch tube installation, stabilization and missile ejection—a far more practical and inexpensive method of first-phase development. The second two possibilities would have benefitted from an examination of the scrapped GOLF II submarines. In addition, it remains unclear if there was any connection or technology sharing with Iran at that time, since Teheran was reportedly experimenting with the development of a submersible launcher for Shahab missile systems during that time period. At least one experimental platform was reportedly tested in the Caspian Sea. Technology and data sharing concerning large missile tube construction, structural requirements, missile configurations and stabilization and control systems would have been extremely valuable to both nations. Further impetus for an SLBM research and development program may have resulted from a series of new naval construction and modernization programs begun during the early-2000s. These included the production of the SANG-O II class (sometimes identified as the K-300) coastal submarine and a refit program for the ROMEO patrol submarines. Both these and other naval construction and modernization programs appear to have been accelerated since Kim Jong Un took over in 2011 and KPN submarines have frequently appeared in North Korean propaganda broadcasts. Figure 1. Kim Jong Un riding in the conning tower of a Type 033 ROMEO patrol submarine from the KPN’s 167 Unit on June 16, 2014. 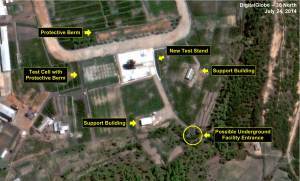 A North Korean Test Stand for Vertical Launch of Sea-based Ballistic Missiles? 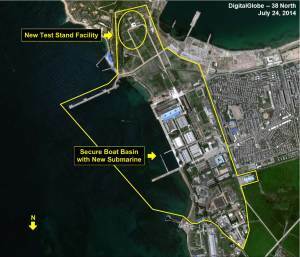 While a review of commercial satellite imagery from 2010 until present covering North Korea’s submarine bases and submarine building shipyards did not identify any evidence that the North had rebuilt a GOLF II submarine, as has been postulated in several reports, it did identify the construction of a new test stand at the Sinpo South Shipyard, located on the east coast. Moreover, while one press report suggested that the SLBM launch tube was sighted at the Mayang-do Naval Base in 2014, such activity is more likely to be conducted by the staff of the Maritime Research Institute in cooperation with the Sinpo South Shipyard (also known as the Pongdae Boiler Plant). The Maritime Research Institute is headquartered at Sinpo on the mainland 4 km to the north-northwest of the Mayang-do Naval Base. Both its location at the Sinpo South Shipyard and the location’s association with the Maritime Research Institute support this assertion. It is likely that the published reports refer to the activities at this new test stand. Figure 2. An overview of the Sinpo South Shipyard. Located approximately 630 meters southwest of the construction way and halls, construction of the new test stand was first identified in September 2013 when an existing small test stand was razed and grading for a new installation began. Accompanying this was a construction effort to reinforce the associated protective berm north of the site. By October 2013, a concrete pad for the test stand had been poured; installation of a larger test stand had begun; a new test cell surrounded by a high protective berm was built adjacent to the test stand; a new support building was under construction; and reinforcement of the existing protective berm had been completed. By April 2014, construction of the new test stand installation was complete. It consists of a 35 x 30 meter concrete pad with an approximately 12-meter-high test stand; a 41 x 32 meter test cell adjacent to the test stand that is protected on three sides by a protective berm; two support buildings protected by protective berms; a possible underground facility; and a 80 x 10 meter protective berm located 25 meters to the northeast of the test stand and situated between the site and the Sinpo South Shipyard. The new test stand installation is of the right size and design to be used by North Korea for research, development, testing (including ejection testing) and evaluation of a vertical launch tube system for submarines and surface combatants and possibly the initial stages of associated missile testing. Moreover, such a program would be a logical outgrowth of the earlier efforts at acquiring SLBM technology and experimenting with incorporating ballistic missile launch technology on a merchant vessel. The development, construction or modification of a submarine equipped with a vertical launch tube for ballistic missiles is just within the upper limit of current North Korean technological and industrial capability. Figure 3. The new test stand at the Sinpo South Shipyard. Exactly what missile system would be utilized in a North Korean SSB is purely speculative at this point in time. North Korea’s capabilities would be stretched to their limit if it used a large liquid-fueled missile system such as a naval version of the Musudan intermediate-range ballistic missile or Nodong medium-range ballistic missile. A naval version of the liquid-fuelled Scud, the solid-fueled KN-02 families of short-range ballistic missiles, or an entirely new system would likely present less of an engineering challenge. Alternately, if North Korea could access vertical or torpedo launched cruise missile technology they might present the easiest and fastest routes to a submarine launch missile capability. Joseph S. Bermudez Jr. is Chief Analytics Officer of AllSource Analysis, Inc.
 Gertz, Bill. “North Korea Building Missile Submarine,” The Free Beacon, August 26, 2014, http://freebeacon.com/national-security/north-korea-building-missile-submarin e/; “North Korea Developing Vertical Launching System for SLBMs.” RIA Novosti, September 15, 2014, http://en.ria.ru/world/20140915/192959025/North-Korea-Developing-Vertical-Launching-System-for-SLBMs–.html; “S. Korea Spots Signs of N. Korea’s Submarine Rocket Development,” Yonhap, September 14, 2014, http://english.yonhapnews.co.kr/national/2014/09/14/65/0301000000AEN20140914000500315F.html; and Jun Kwan-woo. “Is North Korea Developing Submarine-Launched Missiles?” Wall Street Journal, September 14, 2014, http://blogs.wsj.com/korearealtime/2014/09/15/is-north-korea-developing-submarine-launched-missiles. There are unconfirmed reports that the KPN may have recently acquired a variant of the Russian Kh-35 (NATO: AS-20 kayak) anti-ship cruise missile. The 4th Machine Industry Bureau is responsible for production of missiles while the 6th Machine Industry Bureau is responsible for production of naval vessels and equipment. The Academy of National Defense Science’s Maritime Research Institute, located in Sinpo, is responsible for research and development of maritime technology, naval vessels and submarines and naval related missiles. Readily accessible descriptions of all the Soviet submarines mentioned in this article can be found in Polmar, Norman and Moore, K.J. Cold War Submarines, Washington, D.C.: Brassey’s Inc., 2004. The initial reports that there were a total of 40 submarines involved in the contract are erroneous. It is interesting to note that in March 1994, the president of Toen Trade Inc., Ariyoshi Shibata, stated that that his company had only acquired 12 foxtrot class submarines and made no mention of the golf ii. Shibata also stated that the submarines were expected to yield about 2,000 metric tons of ferrous scrap that would be sold to the US, Japan and China. Furukawa, Tsukasa. Toen Trade Inc. was also frequently referred to as the Toen Trading Company. “Old Soviet Submarines Prove to be Tough Sell,” American Metal Market, October 30, 1992, p. 9; Furukawa, Tsukasa. “Subs Tracked in North Korea,” American Metal Market, February 10, 1994, p. 11; Furukawa, Tsukasa. “Subs for N. Korea Called Gutted, Rusted,” American Metal Market, March 4, 1994, p. 11; and Furukawa, Tsukasa. “Japan Government Brakes Sub Breaks,” American Metal Market, May 17, 1994, p. 10. Furukawa, Tsukasa. “Subs Tracked in North Korea,” American Metal Market, February 10, 1994, p. 11. Furukawa, Tsukasa. “Russian Submarine Sale to Korea by Japan Trader Raises Concern,” American Metal Market, January 24, 1994, p. 8. 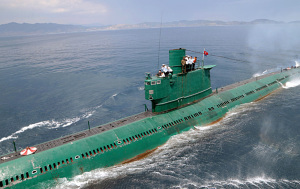 Author interview data; “North Korea Deploys New Missiles,” Jane’s Defence Weekly, August 4, 2004, p. 6, http://www.janes.ihs.com; “Russia Sells North Korea ‘Scrap’ Subs,” Reuters, June 9, 1994; Polmar, Norman, “Letter to the Editor—Old Submarines for North Korea,” Washington Post, June 6, 1994, p. A18; West, Michael, “Korea-Submarines,” Associated Press, May 22, 1994; “Russia Said Not Checking DPRK Sub Dismantling,” Yonhap, 28 April 1994; “Questions Asked on Submarine Sale,” Yonhap, 21 January 1994; and Sanger, David E., “North Korea Buying Old Russian Subs,” New York Times, January 20, 1994, p. A6. Although a small fleet of ballistic missile armed merchant vessels would have nicely fit into North Korea’s developing asymmetric warfare capabilities, there is no evidence available at this time that it pursued this course of development. Project Scorpion would have installed eight 4S-75 vertical launch tube systems for the R-29 (NATO: SS-N-8 sawfly) ballistic missile aboard a derivative of the Project 550 amguema class ice-breaking cargo vessels. Zaloga, Steven J. Sea Scorpion, in Sheppard, Ben (Ed. ), Ballistic Missile Proliferation. London: Jane’s Information Group, 2000. This submersible missile launcher is believed to have been similar in concept to the German World War II experimental submersible V-2 launcher. A submarine would be used to tow the platform to a launch position at sea where it would transition from a horizontal orientation to the vertical by flooding ballast tanks and then the missile would be launched. Bermudez Jr., Joseph S. “KPN Deploys New Version of sang-o Class Coastal Submarine,” KPA Journal, Volume 2, Number 3, March 2011, p. 1-3, www.kpajournal.com; and Bermudez Jr., Joseph S. “Seoul Details New Class of North Korean Submarine,” Jane’s Defence Weekly, March 30, 2011, http://www.janes.ihs.com. The national designator for the Sinpo South Shiyard is presently unknown. Fisher Jr., Richard D. “US, S Korean Sources Suggest North has SLBM ambitions,” Jane’s Defence Weekly, September 22, 2014, http://www.janes.com. Ibid. The development of a vertical launch system would also be of value for cruise missile employment depending upon the type of cruise missile acquired or developed.